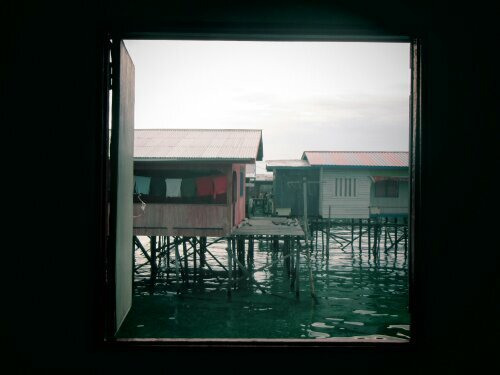 After hearing that Sipadan diving is one of the best in the world, I decided to take a flight to Tawau then catch a mini bus to Semporna to hopefully get a permit. Semporna is a pit hole of a city. For three days I waited for a permit. I was extremely lucky to get one. 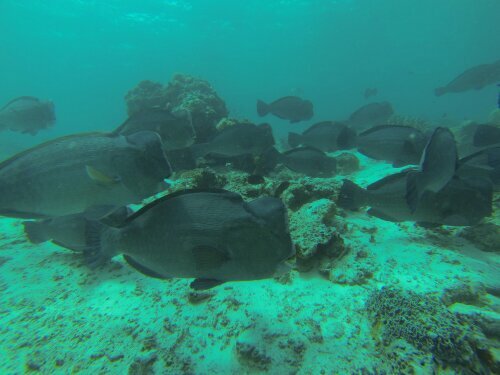 120 permits are issued everyday for snorkelers and divers, but many people plan months in advance, so space is limited. I talked to many people who were unable to get a permit. Again, I was extremely lucky! Semporna is not a place you want to stay. 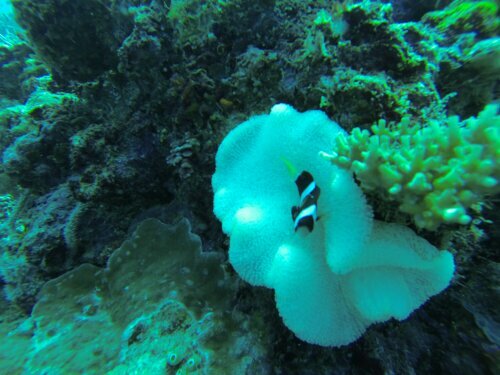 The town is so small and there’s not much to do if you aren’t out snorkeling or diving. The local woman can be extremely rude, the men cat call you constantly (even when you are covered up), and the street smells of sewage. Oh and trash is EVERYWHERE. 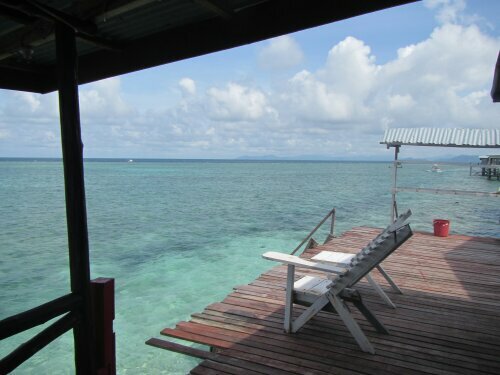 I stayed a total of 5 nights here, but Sipadan was worth it!! I have to stay there two nights before my flight to Bali to meet up with Mandy and Meagan. Eeee, I really can’t wait to see them! 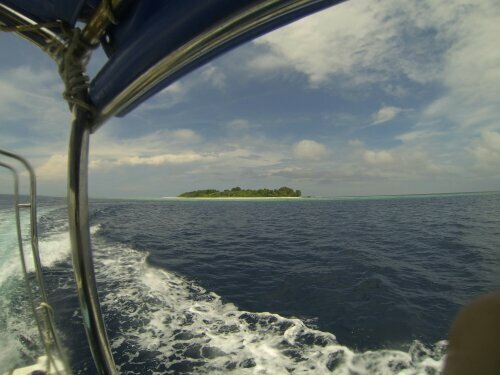 Back to Sipadan. 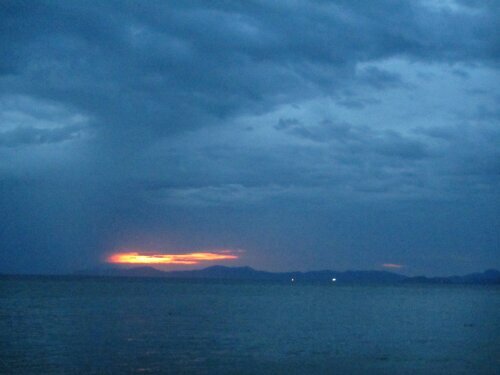 It is a protected island, so you cannot stay overnight there. In fact, they shut down a resort in order to preserve this place. I’m very glad it is protected because I’ve never seen so many turtles in my life. These turtles lay their eggs on the island and they really own the water. People are not supposed to walk around, but I got away for a bit and got to check out the island. It was incredible. Roll call of our dive group: Oscar from Spain, James from Australia, Roslee, the Malay dive master, and of course me! 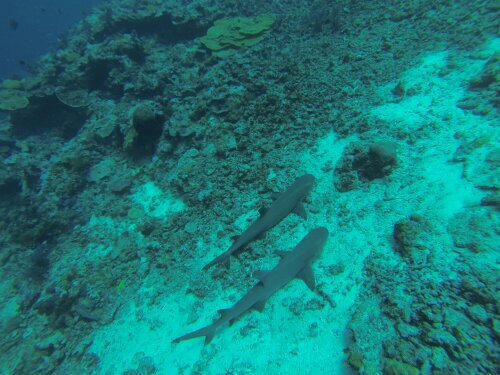 We dove 3 times around Sipadan. Barracuda point was the first and it was excellent. 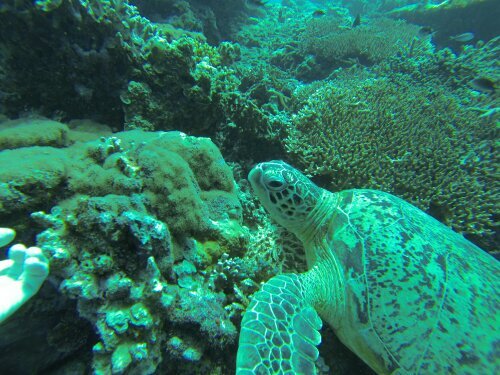 We saw many turtles and White Tip Reef Sharks. Oh and a maneray eel. 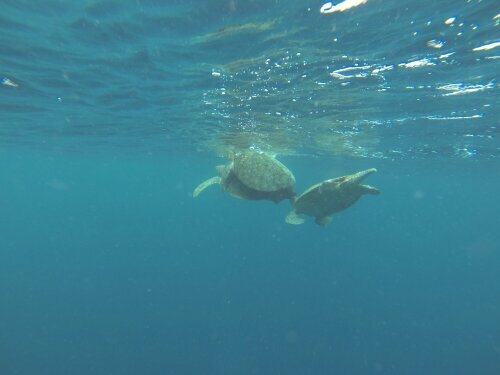 When we first got into the water two turtles were mating and another male was biting the male. The lasts dive was Turtle Cavern, which has a cave where turtles go to die. 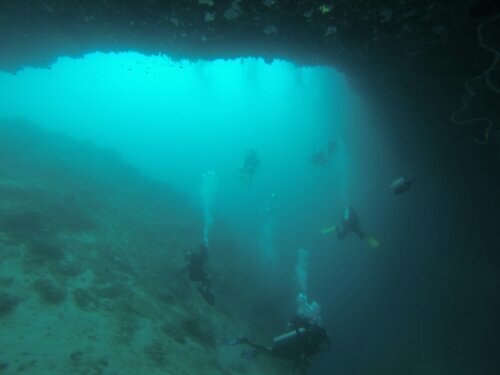 We were able to go into the opening, but you have to have special training to do further cave diving. The cave felt ominous even though I couldn’t see any empty turtle shells. 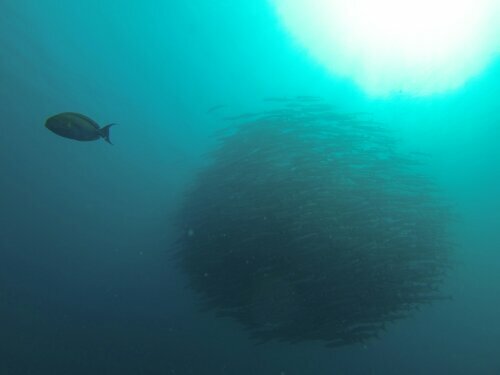 We also saw a huge school of fish. After each dive we got to hang out at the island. 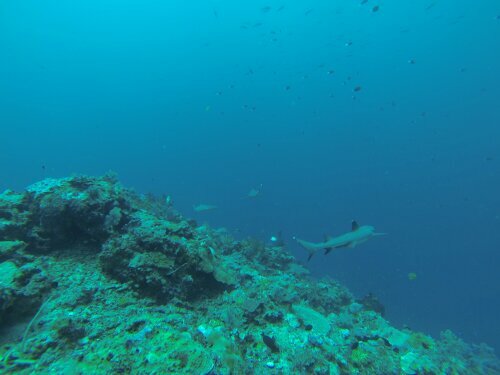 Once we were done with our diving, we headed to Mabul Island, which is right by Sipadan. This island is overrun with shacks on stilts and a couple of nice resorts. I stayed at Scuba Jeff Home stay for two nights. 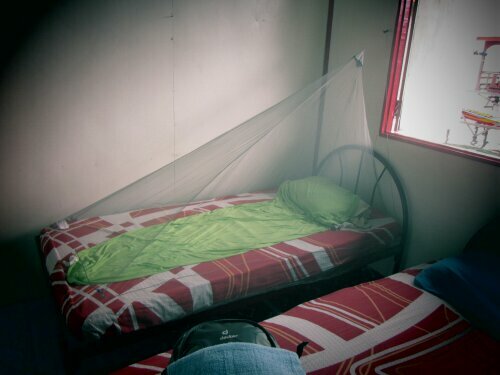 The room was very open, so my mosquito net made all the difference for a comfortable stay. From the deck we saw rays swimming at night and turtles swimming in the morning. 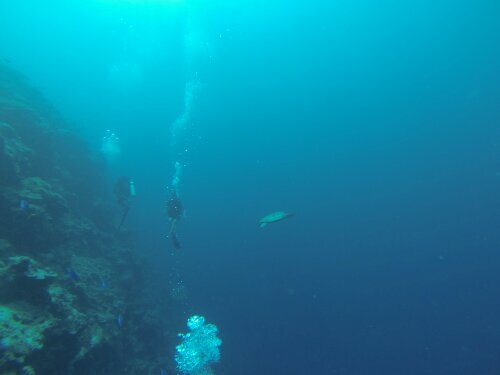 I dove once in Mabul and it was so lame. 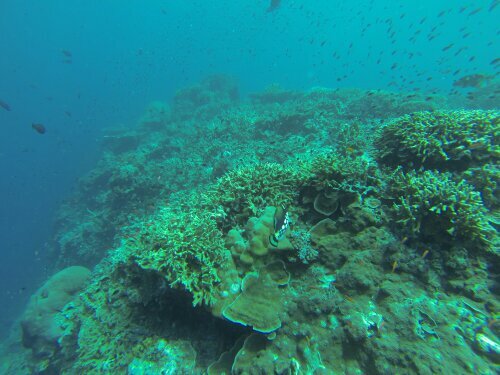 Nothing could really compare to Sipadan. There was a Swedish couple, a French couple and two dutch girls that also stayed at the home stay. They were great to talk to, so I’m really glad they were there. 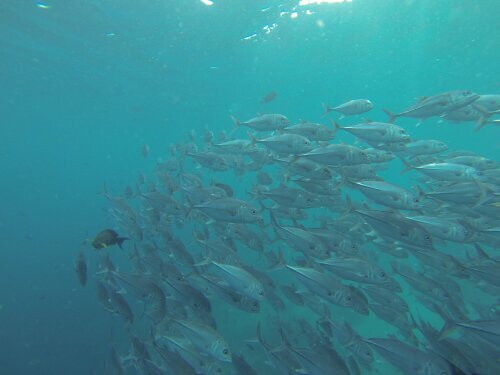 I have to give some cred – all the under water pictures were taken with either Oscar’s or James’s go pro camera. Thanks guys! I got lucky to have you along for the ride. When i get the chance, I will upload videos that they also took. This Post was posted in Malaysia, World Trip 2013 and tagged drop off, go pro, island, mabul, sea turtles, sipadan, turtles, white tip shark. Bookmark the permalink. amazing pictures of the diving!